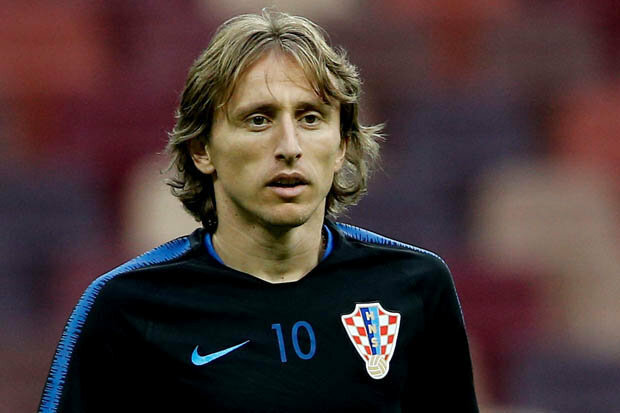 Luka Modric ripped into English journalists and pundits for underestimating Croatia following their 2-1 victory to reach the World Cup final. Kieran Trippier scored a sensational free-kick in the 5th minute to open the scoring at the Luzhniki Stadium but Gareth Southgate’s players were stunned as Ivan Perisic found an equaliser with 20 minutes remaining. As the match was sent into extra time, Modric got more of a hold on the game and the Three Lions’ defence looked increasingly frail. The pressure eventually told in the 109th minute and it was Juventus forward Mario Mandzukic who destroyed England’s hopes with a composed strike past Jordan Pickford. England were favourites to progress to the final after Croatia played out extra-time and penalties twice on the bounce in the knockout stages and Modric slammed his team’s doubters. Speaking after Croatia’s win in Moscow, Modric told ITV Sport: ‘We proved everything differently that people were talking. ‘Especially English journalists, pundits from television, they underestimated Croatia tonight and that was a huge mistake. Southgate claimed England ‘broke through barriers’ during their World Cup campaign in Russia. ‘At the moment we all feel the pain of defeat. I don’t think realistically we expected to be here, but once you’re here and played as well as we did, you want to take those opportunities in life,’ he said after England’s defeat. ‘The dressing room is a difficult place at the moment. I’m remarkably proud of the group of players – the reaction of the supporters compared to two years ago shows the country are proud of the way we played.